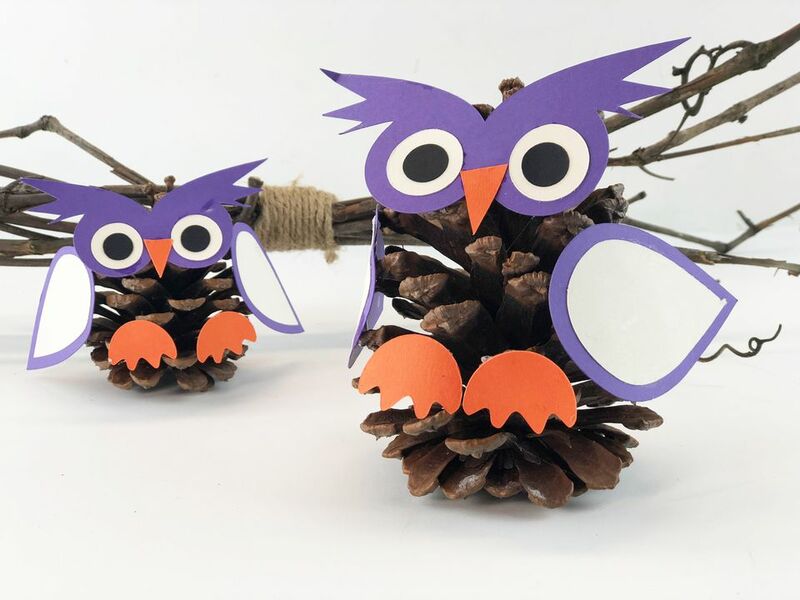 Make some of these charming pine cone owls with your kids. They are very easy and fun to make! This craft is suitable for children ages 5 and up, but they will still need a bit of supervision when using a hot glue gun or cutting template pieces on a digital die cutter. This project should take about 20 minutes to complete, but this does not include cutting and drying time. Also, note that the time guidelines are estimates. This craft can take more or less time depending on your experience. You can expect to need a bit more time to finish the project if you don't usually do crafts. Veteran crafters, however, will find this project to be quick and easy! You can buy packaged pine cones from a craft store, or you can gather you own from underneath a pine tree. If you decide to use found pine cones, make sure to get rid of any hidden bugs, seeds, and sap. Download the free PDF templates and SVG files that can be used on most digital die cut machines. Decide what colors you would like your owl to be and choose cardstock in those color schemes. You can cut out the template pieces on a digital die cut machine with the free downloadable SVG files. Kids will probably need a bit of help from an adult with this step of the craft project. A digital die cut machine is helpful to use, but you can get excellent results cutting out the template pieces by hand with scissors. If you are making the owl by hand, print out the PDF template onto the corresponding colored cardstock and then cut with scissors. Glue the two beige circles onto the head of the paper owl using a glue stick or craft glue. These circles will be your owl's eyeballs. Attach the smaller wings on top of the larger wings with a glue stick or craft clue. Let the beige circles dry and then glue the two black circles onto the center of the beige circles that represent the eyes of the owl. The black circles are the pupils of the eyes. Apply some glue to the orange triangle that represents the beak of the owl and place between the eyes. Press the beak down firmly with your fingers to ensure adhesion to the head of the owl. Apply a bit of hot glue to the back of the owl head and place firmly onto the pointy end of the pine cone. To ensure proper adhesion, you may have to hold the piece down with your fingers for a while until the hot glue cools and becomes firm. Attach the wings to the pine cone with hot glue using the photo above as a reference guide. Tip: Hot glue can burn your fingers. Always use common sense when handling a hot glue gun. Smaller children should always have adequate supervision when handling a hot glue gun. Attach the paper feet with hot glue onto the bottom of the pine cone. To ensure adhesion, press the feet firmly down with your fingers onto the cone until the glue is cool. To finish your pine cone owl, glue the bottom of your owl onto the branch or place the bird beside the branch to complete the design. Use these owls as home decor or try making a quick buck selling them at the county fair. Most importantly, craft projects allow parents to spend quality time with their children. Enjoy the bonding time while children are still young enough to want to hang out with their parents!